This worksheet allows students to practice drawing simple series and parallel circuits and calculate using Ohm's law. 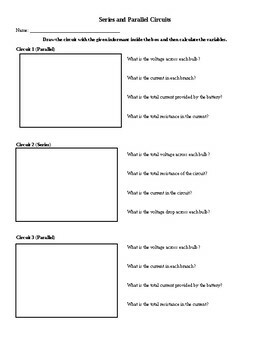 In order to use, every student will get the sheet with the squares and questions. Then each student will get a strip of the other sheet that has four sets of different circuit problems. The students will draw the circuit in the box and then answer the questions using the given information for each circuit.